Supplementary material reads: "Gershon. City Desk. Illus. School vaccination. Varied reactions of Harbor City Elementary School as they underwent first of this year's vaccination against smallpox in city school system are shown in following pix: No. 1: Kathy Ann Griffin, 5. No. 2: Jeannie Garcia, 5. No. 3: Rita Delmasitos, 6. No. 4: Patrick Simpson, 5. No. 5: Bulb failed. No. 6: Eddie Rue, 5. No. 7: Left to right: These kiddies show mixed attention as they await turn, Donna Alexander, 5, Jacqueline Cheek, 5, Steven Cheek, 2. No. 8: Mrs. R.B. Cheek holds son Steven, 2, while Donna Alexander and Jacqueline Cheek look on with wrapt attention. No. 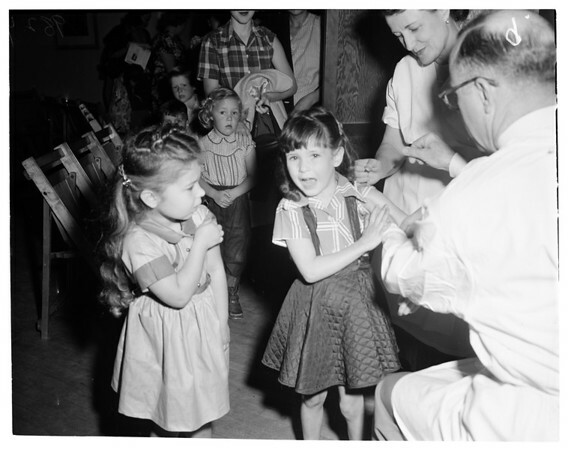 9: Jacqueline Cheek watches while Donna Alexander gets vaccinated. No.10: Jacqueline Cheek gets needle. No.11: Johny Murray, 5. No.12: Jimmy Alexander, 5 'didn't want to look' so mother, Mrs. James Alexander holds hand over eyes. In all shots Dr. Dean W. Gillman, Harbor District Health Officer, does vaccinating assisted by Nurse Mrs. Marie Evins. All kids are kindergarten students, 272 students were vaccinated".